Written by Guest Post on Wednesday, 07 December 2016. Dietitian Caroline Trickey says she enjoys demonstrating this recipe in her cooking classes as it is a firm favourite of hers and so easy to make. The soup is delicious just as it is, but with the addition of the olive oil and lemon juice on top, the flavours are intensified. 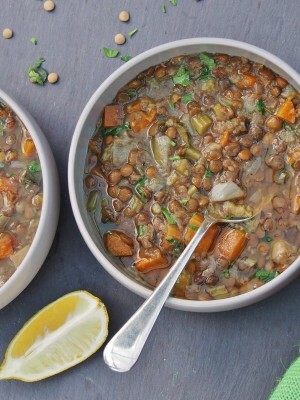 Based on the classic Greek lentil soup but with a lot more vegetables this is a hearty soup you won’t regret making! 788kJ (188 calories), 12g protein, 4g fat (including 0.5g saturated fat), 22g carbohydrate and 9g fibre. No sodium figures provided. 1. Heat a large pot over medium heat. 2. When hot, add oil, onion and garlic and sauté until soft, 3-4 minutes. 3. Meanwhile, rinse the lentils and drain well. Add to the pot along with the vegetable stock, celery, carrot, zucchini, oregano and pepper and bring to the boil. 4. Lower heat to a simmer, cover and cook for 20-25 minutes or until lentils are just soft. 5. Place a handful of spinach leaves in the bottom of each of 6 soup bowls. 6. Ladle the soup on top, sprinkle with parsley, then drizzle with a little extra olive oil and squeeze plenty of lemon juice over the top. Store cold, cooked soup in the fridge for up to 5 days or in the freezer for up to 2 months. Recipe courtesy of dietitian Caroline Trickey from Healthy Home Cafe. For more great recipes, check out her ebooks Veggie-Licious Autumn-Winter and Veggie-Licious Spring-Summer. These are digital cookbooks (e-book) with resources to help you eat more plant-based meals. Q. How do I get my kids to eat vegetables? Which vegies are the real nutrient powerhouses?